At least there are 4 semiconductor fabs with immediate FinFET capabilities which are Intel, TSMC, Samsung and GlobalFoundries. There are other 4/5 fabs progressing faster towards finFETs. With the success of FinFET, most of the logic chip foundries got to move to FinFET process. That's the one of the reason why semiconductor equipment industry body SEMI has forecasted semiconductor equipment sales will reach $43.98 billion in 2014, a 21 percent increase over estimated 2013 equipment spending. Following two years of conservative capital investments by major chip manufacturers, semiconductor equipment spending is forecast to grow to $43.98 billion in 2014, up from $36.29 billion projected this year. Key drivers for equipment spending are significant NAND Flash fab investments by Samsung in China and Toshiba/Sandisk in Japan, and investments by Intel, including its fabs in Ireland. 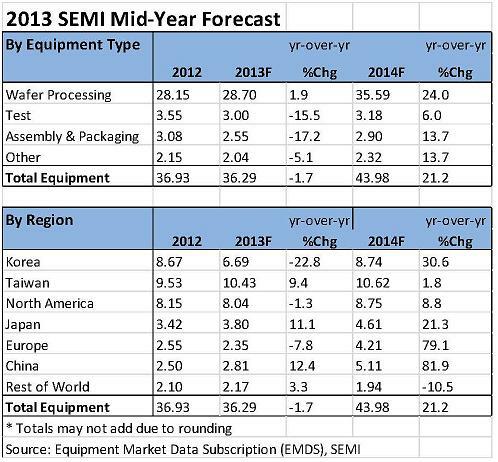 Most major regions of the world will see significant equipment spending increases. Front-end wafer processing equipment will grow 24 percent in 2014 to $35.59 billion, up from $28.70 billion in 2013. Test equipment and assembly and packaging equipment will also experience growth next year, rising to $3.18 billion (+6 percent) and $2.9 billion (+14 percent), respectively. The forecast indicates that next year will be the second largest spending year ever, surpassed only by $47.7 billion spent in 2000. A special note on the Taiwan by SEMI: The latest SEMI Consensus Forecast projects the Taiwan equipment market will rise more than 9 percent in 2013 and another two percent in 2014 to reach $10.6 billion, maintaining Taiwan's status as the world's largest equipment market.